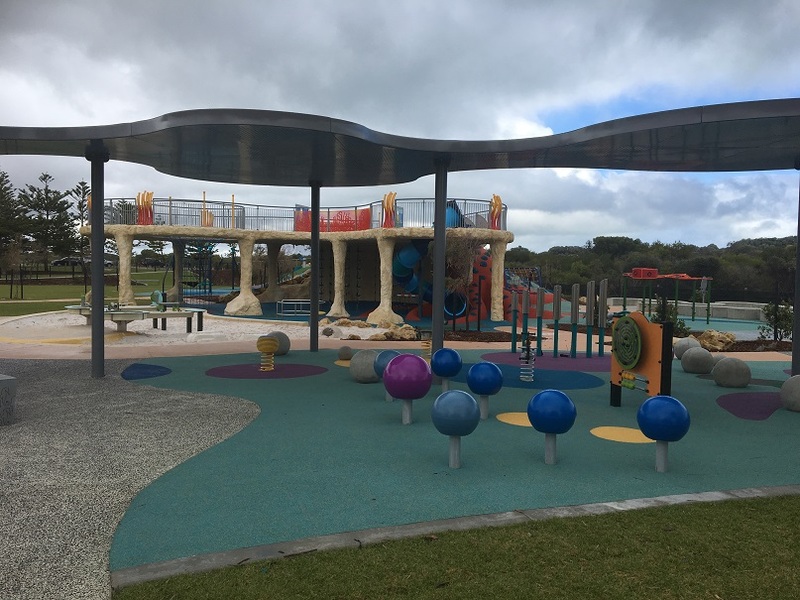 The Harbour Playground is a big underwater themed playground close to the beach alongside the Secret Harbour Surf Lifesaving Club. 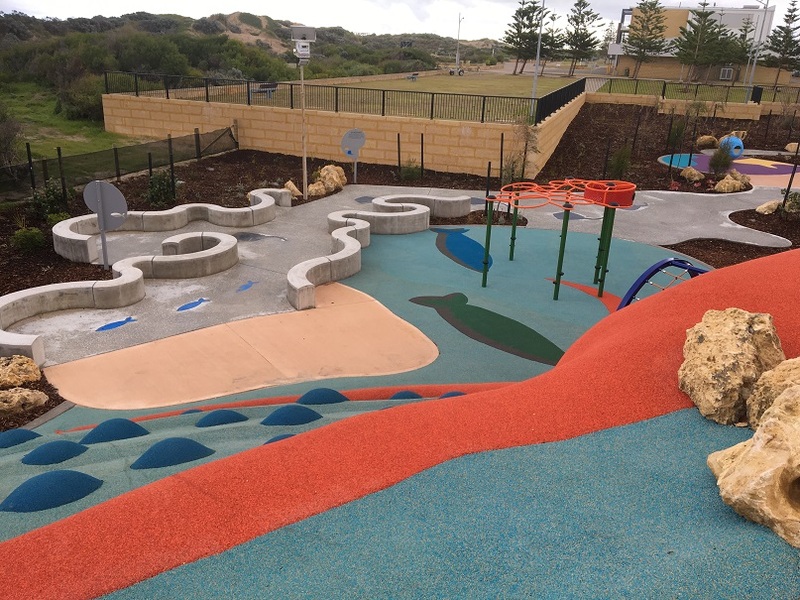 The playground features a large orange octopus embeded into the soft fall on the hill that kids can climb all over to access the top and look out over the whole park. 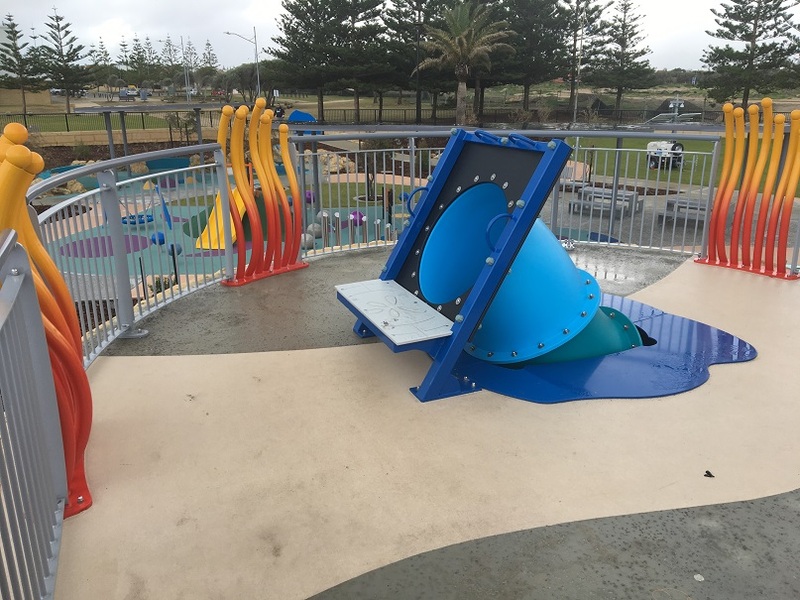 At the top are entries to the slide and top of the rope climb whirlpool as well as some role play fun where kids can pretend to be a mermaid or scuba diver. There is ramp access to the top of coral cave also with anemone balustrading so it can be accessed by all abilities. There is seating at the top in case you want to sit a while and enjoy the view. The limestone "coral cave" totally feels like an underwater cave and makes for fun and adventure out of the rain and sunshine. Under here kids can exit the slide, and climb the whirlpool rope climb back to the top, or take on the other rope challenges. 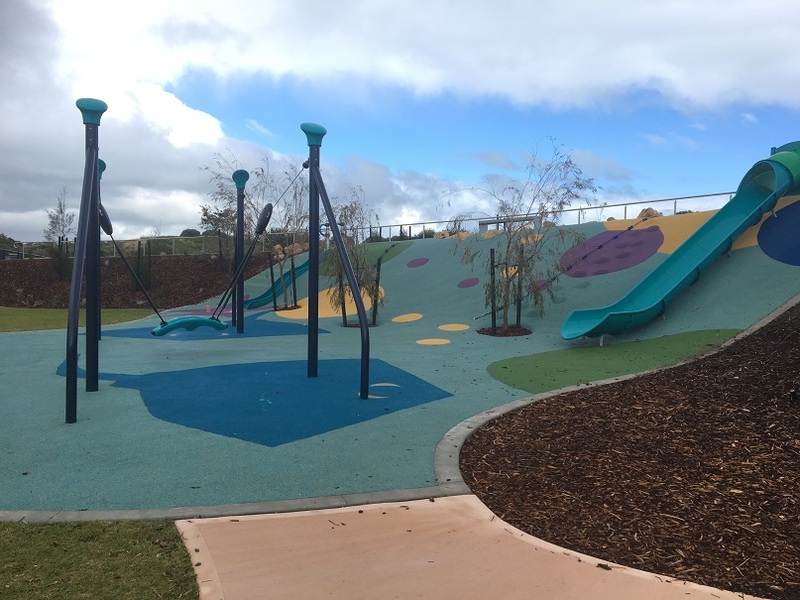 You can never have too many slides in a playground! On the other side of the octopus hill are another couple of slides (a little smaller than the big windy slide that goes from the top to the bottom of the coral cave). This area is a good challenge with kids either climbing their way to the top by foot or using the ropes for assistance. 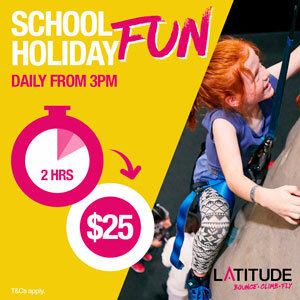 Here you can also find a cruise line swing, which is a cross between a flying fox and a swing. 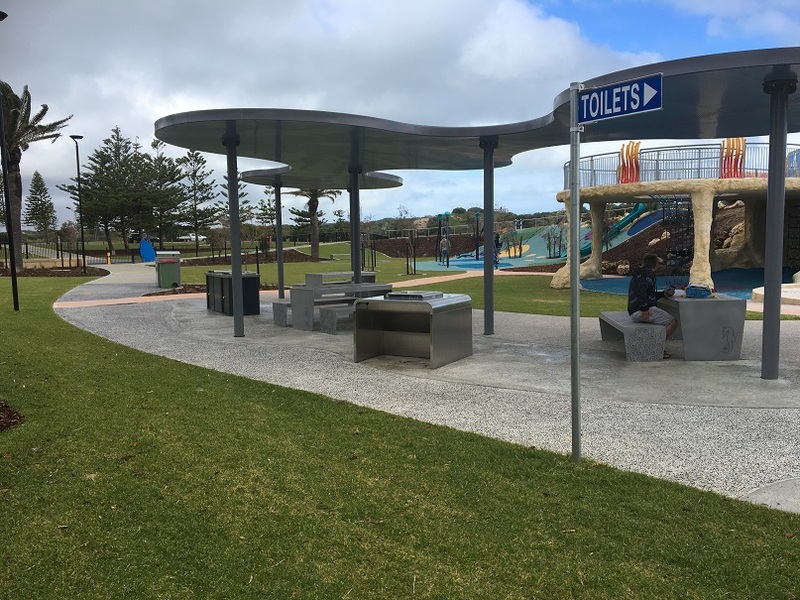 Two children can sit face to face on the swing seat and ride the flying fox together. 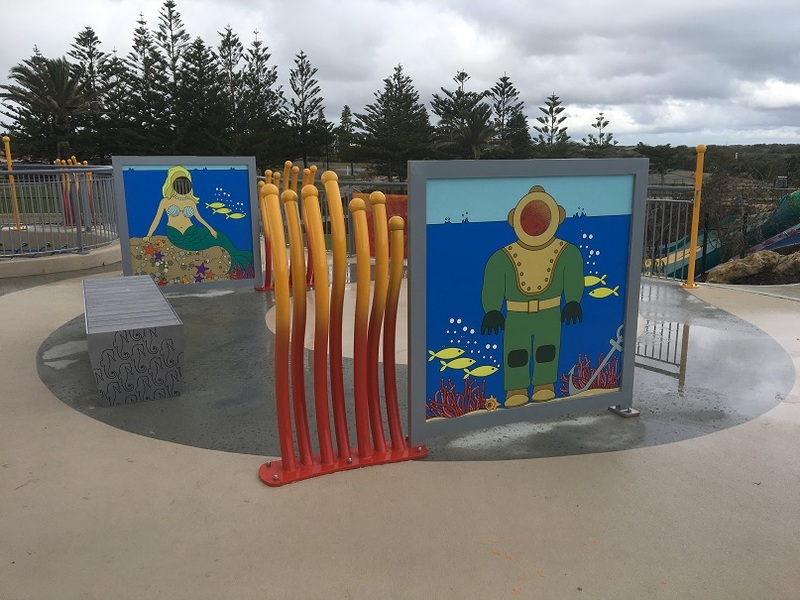 Don't think you'll get away with a play at this playground without learning something about the underwater world. 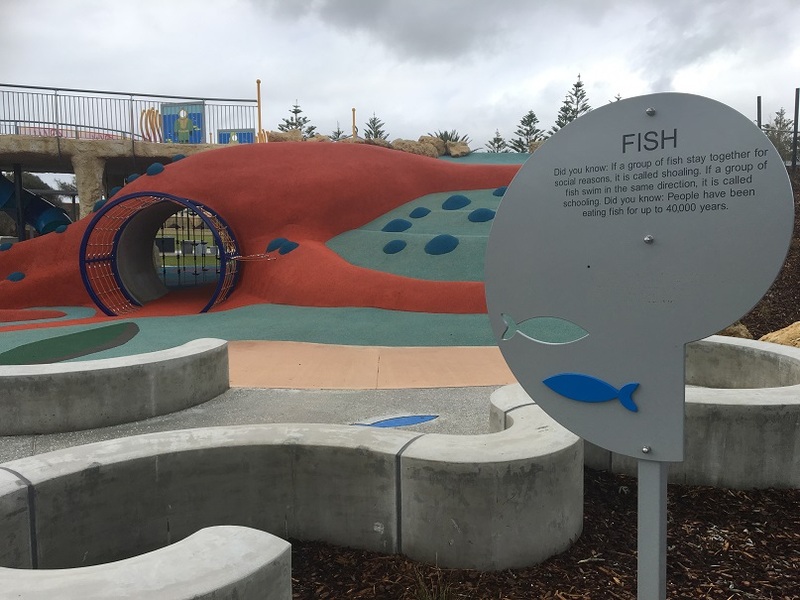 Enjoy some fun facts at the concrete fish maze. 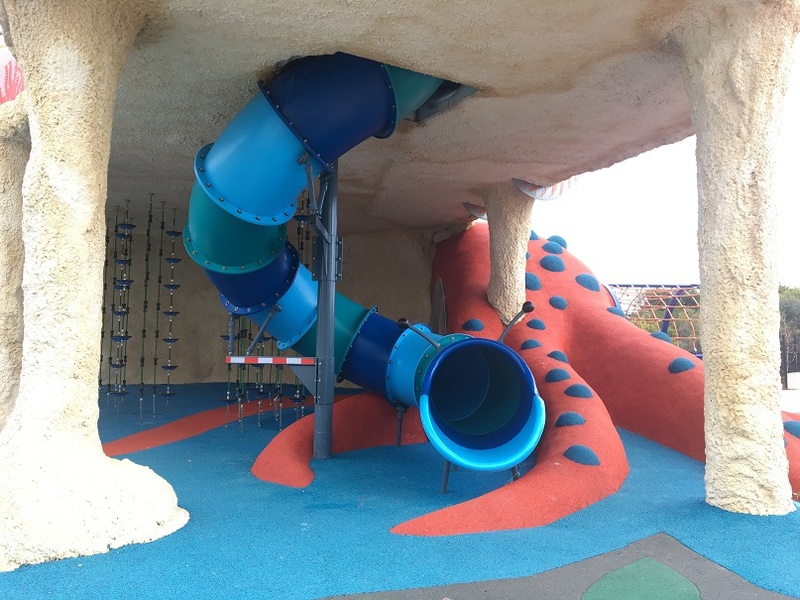 There is a fun set of monkey bars alongside the big octopus here too. 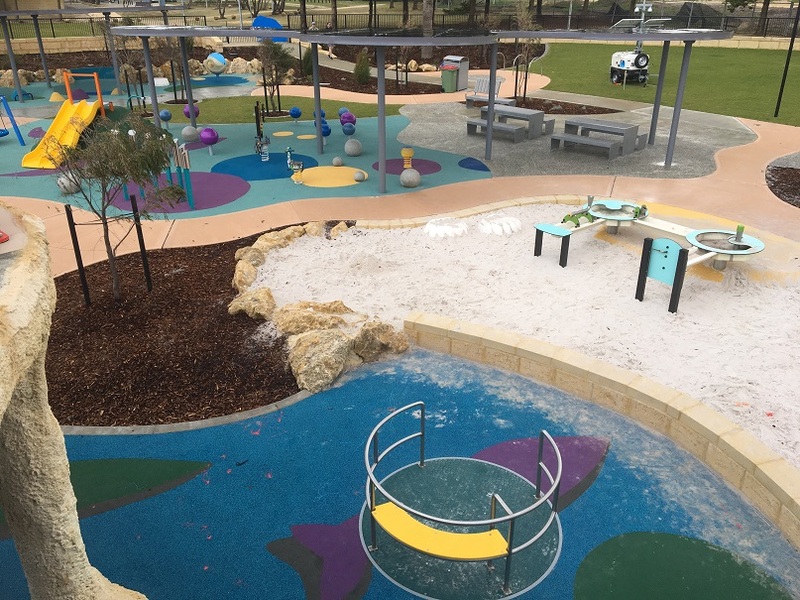 The little kids have an underwater play area of their very own. 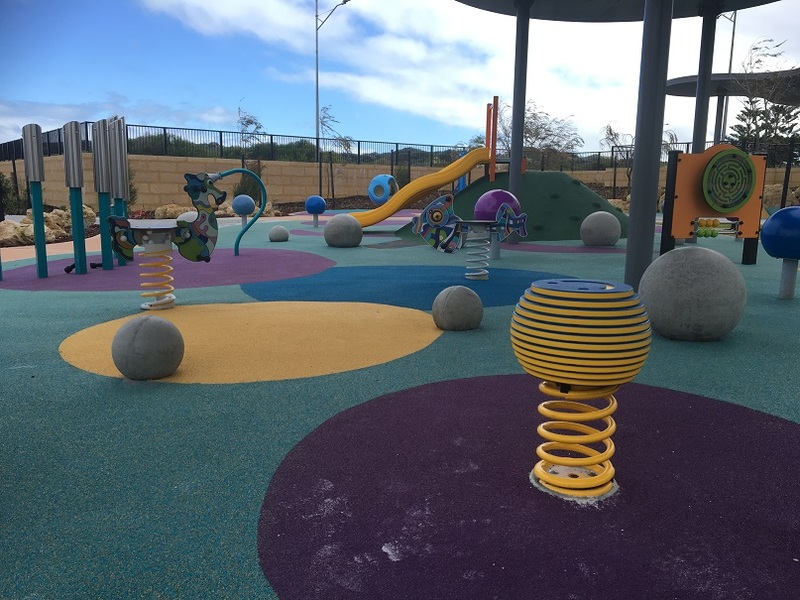 This play area also includes some all abilities play with a sand table that is wheelchair accessible. Lots of the play equipment in the little kids area is on a smaller scale. I don't think I've ever seen a basket swing that small. 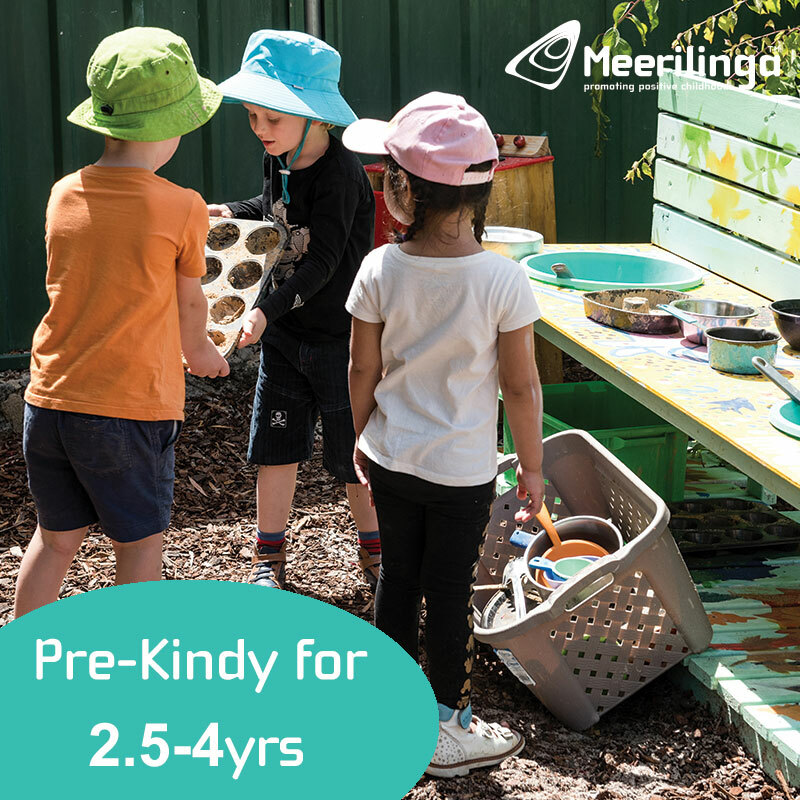 There is lots of sensory play including musical instruments and this well shaded area has all the fun for babies and toddlers. 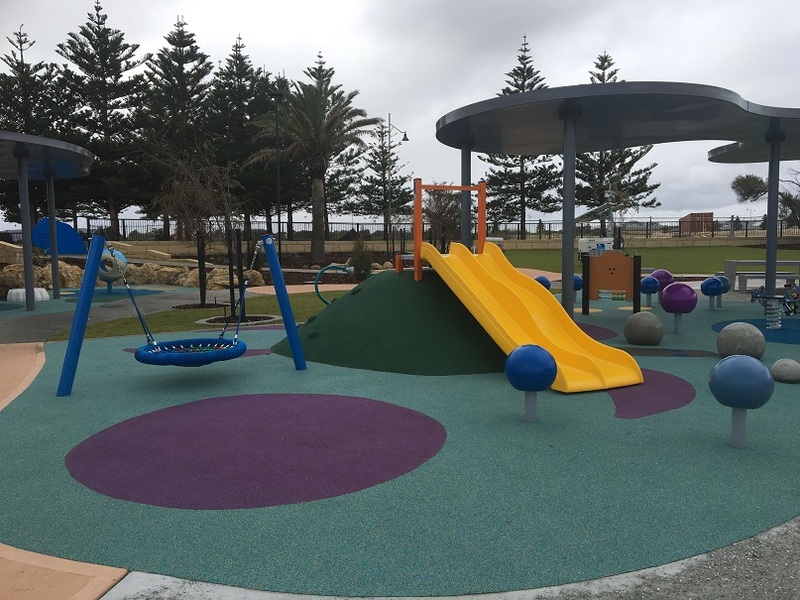 Located close to the beach and with a kiosk nearby this is playground is bound to be a summer hot spot and a fun place to play all year round. 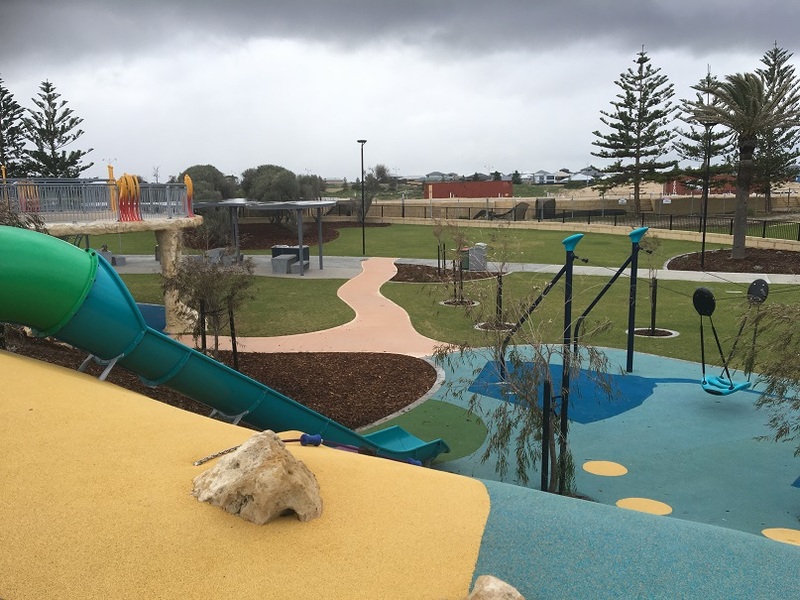 Parking is available of both sides of the playground.